We investigated the relationship between apple skin color and internal quality characteristics, such as the concentration of functional compounds, physicochemical and textural properties. The skin color of ‘Fuji’ apples (N = 420) was determined and the apples were categorized into three classes (class A, N = 231; class B, N = 130; class C, N = 59). The apple skin color values correlated significantly with flesh color intensity. For sensory attributes, the yellow color intensity of apple flesh had a positive correlation with redness (a*, r = 0.781) and ΔE(r = 0.787) of apple flesh color (r = 0.787). There was strong correlation between a*, and the chemical properties of apple flesh. Apple skin color (a*) was positively correlated with total juice content (r = 0.784), soluble solid contents (r = 0.626), soluble solid contents/total acidity (r = 0.697), fructose (r = 0.444), sorbitol (r = 0.476), and sucrose concentrations (r = 0.823), respectively. However, malic acid (r = − 0.525), shikimic acid (r = − 0.443), and total organic acid concentrations (r = − 0.519) correlated negatively with a*. The a* value also showed positive correlations with phenol and anthocyanidine concentrations, but a negative correlation with DPPH, FRAP, and ABTS concentrations. 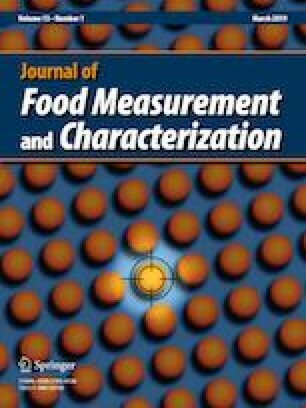 A principal component analysis was performed to analyze functional compounds, sensory attributes, and physicochemical properties of apple skin and flesh; the total variance was 91.31% (F1; 58.92%, F2: 32.39%), 84.55% (F1;50.86%, F2;33.69%), 90.37% (F1;75.74%, F2; 14.63%) and 57.20% (F1;41.92%, F2;15.28%), respectively. Our results confirmed a strong correlation between the ΔE and a*, which are indicative of the skin color and the internal quality measures of the Fuji apple. Thus, the skin color of Fuji apples seems to be a reliable index of internal fruit quality. This research was supported by the Main Research Program (E0187301-01, E0132200-05) of the Korea Food Research Institute (KFRI) funded by the Ministry of Science and ICT.